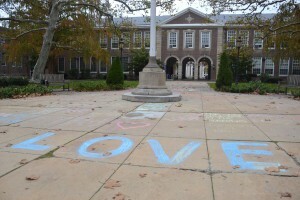 About 25 students arrived before the school day began on Monday, Nov. 14, and wrote the messages in hopes of letting students know they are in a positive, loving and supportive community. 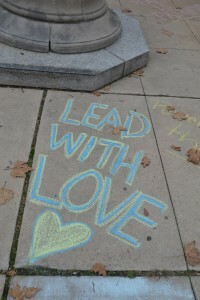 Fontaine was spurred to action after seeing similar positive chalk writing on the library steps while visiting her sister at Yale University. At the end of fall break, Fontaine texted five of her friends about her idea, and the interest among her classmates grew so quickly that a Facebook group was created with more than 70 members. Although not all participated, even having more than originally planned was a pleasant surprise, Fontaine said. “I was nervous and worried people didn’t feel the same way. When I saw so many people did feel the same, it made me feel better. I think that made people feel comfortable,” Fontaine said. “It was good to see a group of people who all felt the same way as us so we could support each other,” fellow junior and chalk writer Sophie Pancoast said. The students met at 6:20 a.m. and started writing messages along the sidewalk, from the entrance of the school down to the road. There were messages talking about love, hope, equality and strength. 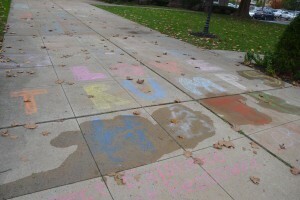 For the most part, students and members of the community who saw the chalk writing appreciated its message, Fontaine said. There were students who stopped to take pictures or point out particular messages to friends. Some messages — particularly “love trumps hate” and “build kindness not walls” — were washed away with water at day’s end. A few students fixed the “love trumps hate” message. 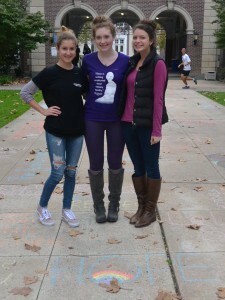 Fontaine, fellow junior Taylor Bee and Pancoast hope their message came across. Though they couldn’t vote on Nov. 8, they felt doing something positive over the negativity seen around the nation was something they could do to help. “The election is over, but the presidency hasn’t even started … and there are hate crimes happening all over the place,” Bee said.